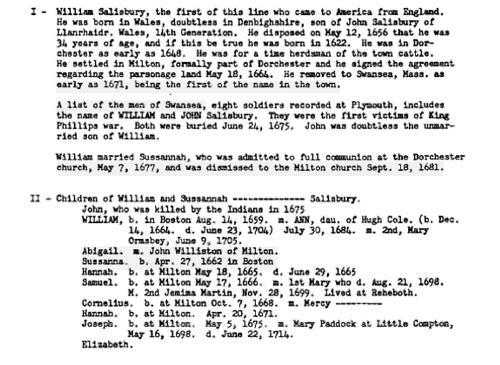 "Maine Births and Christenings, 1739-1900," database, FamilySearch (https://familysearch.org/ark:/61903/1:1:F4S8-8Y8 : 4 December 2014), Annie E. Hale, 28 Nov 1862; citing Civil, Lee, Penobscot, Maine; FHL microfilm 11,531. Sixteenth Census of the United States, 1940, Washington, D.C.: National Archives and Records Administration, (1940) , Census Place: Los Angeles, Los Angeles, California; Roll: T627_403; Page: 1A; Enumeration District: 60-838. Rev. Heman R. Timlow, Ecclesiastical and other sketches of Southington, Conn., , p. 266. Susanah (?) was born perhaps about 1644. Vital records of Salisbury, Massachusetts, to the end of the year 1849, Topsfield, Mass. : Topsfield Historical Society, (1915) , p. 264. 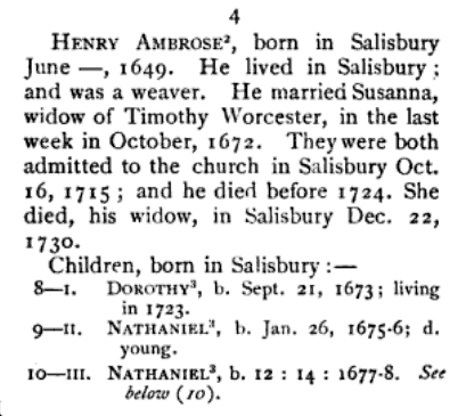 Unknown author, "Ambrose Family", The Essex Antiquarian Vol. 3 (1899): p. 74. George Rich, Genealogy: ancestors and descendants of John Sanders, Fort Covington, N.Y., , at http://books.google.com/books?id=BhxPAAAAMAAJ . (1922) , p. 21. Susannah (?) was born perhaps about 1648. John F. Norton and Joel Whittemore, The History of Fitzwilliam, New Hampshire, from 1752-1887, , at https://books.google.com/books?id=HfzuC7MFRzUC . New York: Burr Printing House, (1888) , p. 725. Barbara Stone Chase, Stone-Gregg genealogy: the ancestors and descendants of Galen Luther Stone and his wife Carrie Morton Gregg, Gateway Press, (1987) , pp. 6-8. Vital records of Sudbury, Massachusetts to the year 1850, Boston, Mass. : The New England Historic Genealogical Society, (1903) , p. 139. Charles Nutt, History of Worcester and Its People, Vol. 4, , at https://books.google.com/books?id=p3VKAAAAYAAJ . New York City: Lewis Historical Publishing Company, (1919) , p. 782. Vital records of Sudbury, Massachusetts to the year 1850, Boston, Mass. : The New England Historic Genealogical Society, (1903) , p. 140. Susannah (?) was born perhaps about 1637. 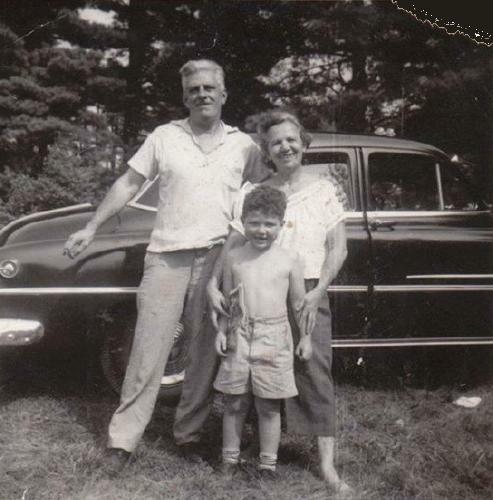 Velma Salisbury Button, History of the Salisbury family 1022-1950, , at https://books.google.com/books?id=iCxPAAAAMAAJ . (1950) , p. 6. Thankful (?) was born perhaps about 1718. "Connecticut Deaths and Burials, 1772-1934," database, FamilySearch (https://familysearch.org/ark:/61903/1:1:F7V1-GJZ : 3 December 2014), Moses Royce, 17 Aug 1768; citing , reference 29; FHL microfilm 3,367. Thelma Marie (?) was born perhaps about 1935. This is NOT Thelma Gilbertson. Merrill, Frank H (Theresa) driver. house 66 High Street. living at 18 Fowler St., Danvers, Massachusetts. Sixteenth Census of the United States, 1940, Washington, D.C.: National Archives and Records Administration, (1940) , Census Place: Danvers, Essex, Massachusetts; Roll: T627_1579; Page: 12A; Enumeration District: 5-58. 1930 United States. Bureau of the Census. 15th census, United States, 1930 federal census : population schedules ; NARA microfilm publication T626, Washington, District of Columbia: Bureau of the Census Micro-Film Laboratory, ([19--?]) , Census Place: Danvers, Essex, Massachusetts; Roll: 895; Page: 8B; Enumeration District: 33; Image: 758.0; FHL microfilm: 2340630. Vera (?) was born perhaps about 1848 in Russia. Vera married Simon H. Rovinsky. "United States Census, 1920," database with images, FamilySearch (https://familysearch.org/ark:/61903/1:1:MHWN-27N : 14 December 2015), Star Neal, San Francisco Assembly District 21, San Francisco, California, United States; citing sheet 3B, NARA microfilm publication T625 (Washington D.C.: National Archives and Records Administration, n.d.); FHL microfilm 1,820,133. Carolyn C. Abbott is online at https://www.facebook.com/carolyn.abbott.967. 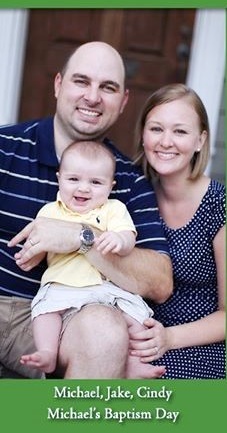 Christina Marie Abbott was born on October 11, 1984. She is the daughter of Frank Warren Abbott Jr. and Janet Leighton Miller. 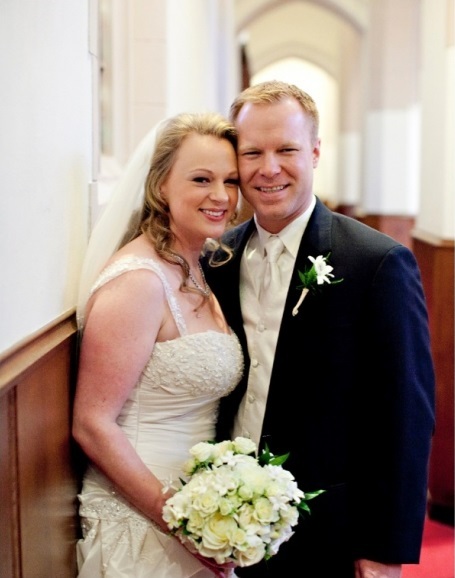 Christina married Steven James Cavoretto on February 19, 2011. Christina Marie Abbott is online at https://www.facebook.com/christina.cavoretto. living at Hopkinton, Merrimack County, New Hampshire. living at Ward 1, Manchester, Hillsborough County, New Hampshire. Matthew Adams Stickney, The Fowler Family: a Genealogical Memoir of the Descendants of Philip and Mary Fowler, of Ipswich, Mass: Ten Generations: 1590-1882, , at https://books.google.com/books?id=RMwUAAAAYAAJ . Salem, Mass. : Salem Press, (1883) , p. 172. 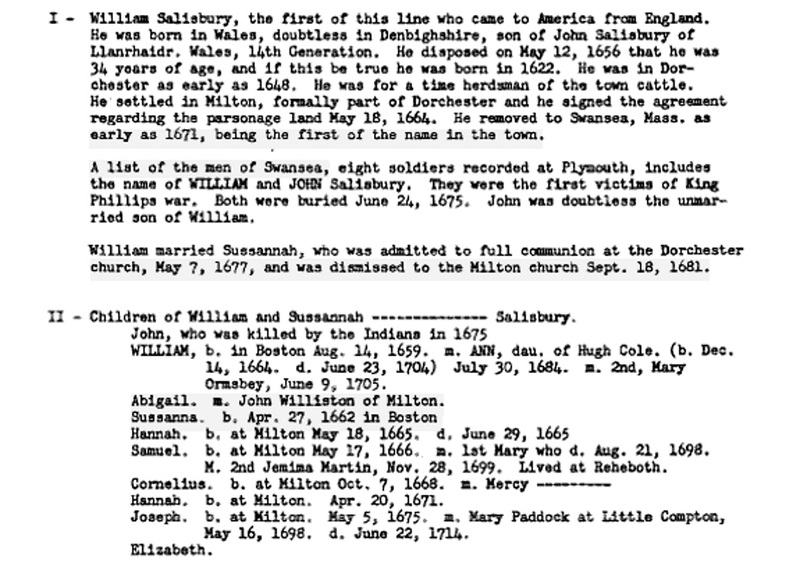 "New Hampshire, Death Records, 1654-1947," index and images, FamilySearch (https://familysearch.org/pal:/MM9.1.1/FSVS-Q22 : accessed 07 Nov 2012), Esther Ann Green, 11 Mar 1928. 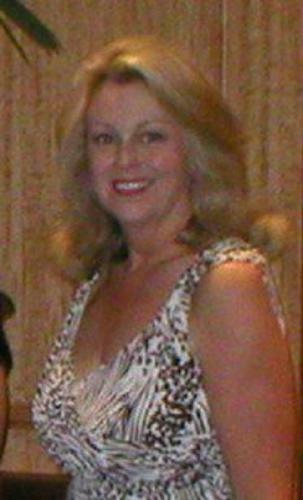 As of 2012, Cindy Donaldson lived at 4002 Tennyson St., Houston, Harris County, Texas, She is director of the Texas Association of Partners In Education. Cindy Donaldson is online at https://www.facebook.com/cindy.a.donaldson. Diane Eileen Abbott lived at San Marino, Los Angeles County, California. She attended Mayfield Senior School in Pasadina, and University of Southern California, where she began her college career in the School of Architecture, before deciding to focus on design and development. Dianne earned her Bachelor of Science degree from the School of Public Policy, Planning, and Development and completed a minor in Business Administration. Prior to joining Realty Advisory Group, Inc. Dianne worked for Shea Homes, the nation's largest privately held home builder. At Realty Advisory Group she became a member of its Industrial Brokerage Group. Development, Inc.
Diane Eileen Boskovich is online at https://www.facebook.com/dianne.boskovich. Birthdate: 8 Aug 1983; Birth County: Los Angeles. Elena Folger Abbott was born on October 18, 1987.